Julius Monk will have the scene etched in his mind forever—a concrete slab, a classroom with no roof, and a principal asking him for a list of supplies to make the repairs. Monk had to tell her. No amount of supplies would make it right. The school needed major work, and it had to remain closed. She was heartbroken. Her school for children ranging from 18 months to 6 years old, tucked in the southeastern corner of Puerto Rico, was the communal hub in Yabucoa, a city of 38,000 people. Parents and volunteers stood ready to rebuild. But that couldn’t be done. A hurricane with 155 mph winds had barreled into the school and ripped off the roof, waterlogged her classrooms, and turned the walls to putty. “That tugs at your heart,” Monk says. In North Carolina, Monk makes sure every school in his district has warm classrooms, a solid roof, and the safest spaces where education can happen for 73,000 students attending the county’s 126 public schools. Monk is the executive director of facilities for Guilford County Schools. 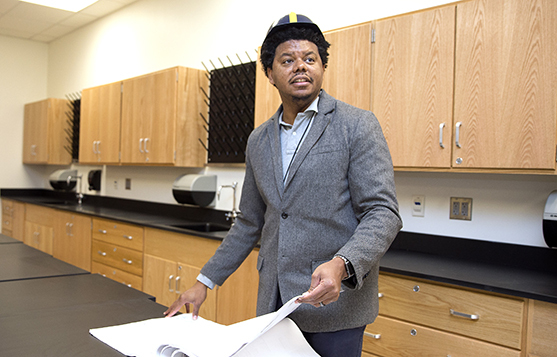 He and his 14-person staff inspect and monitor the district’s 12 million square feet that represent the brick-and-mortar spaces in which students learn and grow. Monk was one of seven school district leaders picked nationwide to review the damage caused by Hurricane Maria to the island’s schools. He went in early November, joining school construction experts from urban school systems in Baltimore, Cleveland, Houston, Miami, New Mexico, and Fresno, Calif. In eight days, they saw 33 of the island’s 1,300 schools. They traveled to sites from as close as 15 minutes from their hotel in San Juan to those three hours away into the island’s mountainous western side, where roads were as steep as a rollercoaster incline. Though Monk had never been to Puerto Rico, he was no stranger to hurricanes. He grew up in Warsaw, North Carolina, and he remembers filling bathtubs full of water, riding out a hurricane with his cousins in his grandmother’s house, and losing power for at the most two weeks. But not for three months like in Puerto Rico. Hurricane Maria caused at least $72 billion in damages, blacked out the entire island and, according to some estimates, killed nearly 1,100 people. There are still sections of the island without power, and, according to the Washington Post, Puerto Rico is now struggling to function during the largest blackout in U.S. history. That is what Monk saw firsthand. During their island-wide inspections, Monk visited schools in various stages of repair and ruin. Some schools seemed normal, until he asked about what had happened and heard about how troops of volunteers came together and worked weeks to repair what Hurricane Maria had damaged. He saw heating and air conditioning units as big as Volkswagen Beetles tossed like a toy car off a roof, and spotted big utility transformers propped on a 2-by-4 in the middle of the road. In some buildings, the island’s heat and the aftermath of the storm surge had turned drywall into rot and created a stench that had him reach for his mask and walk faster. Then there was the bridge. He and his cadre of school officials drove over a bridge en route to another school. Forty-five minutes later, the bridge had disappeared. A river swallowed it. Monk stood on the other side and took a video of a truck driving across an underwater bridge, and he immediately remembered when he was a teenager in Warsaw, driving through standing water and feeling his Geo Metro lose control. It was the most frightened Monk had ever been in his life. And here was a guy in a truck driving across a submerged bridge-—and he made it. Monk saw that perseverance everywhere in Puerto Rico, an island 100 miles long and 30 miles wide. The people he talked to and the teachers he met weren’t waiting on federal assistance. They were relying on themselves. He saw communities rallying to repair their schools, and when he and the other school officials talked to Julia Keleher, Puerto Rico’s secretary of education, they heard firsthand what the U.S. territory wanted done. They saw Keleher’s passion and her tears. Like many, Monk had heard the rumblings about Puerto Rico’s commitment and read the tweets from President Donald Trump. But what he saw in Puerto Rico as he and the others worked 16-hour days made him pause and think about priorities. “Let’s be better stewards and not punish children,” Monk says today. “If students miss 60 days or 90 days of school at a time, you’re affecting future generations on that island, and there is no way we’d allow that to happen in North Carolina, the continental United States, or on our island state of Hawaii. After a week of observing, of not taking showers for two days and climbing 16 flights of stairs to his hotel room when the power was off, Monk and the other school officials gave Keleher a 236-page report on what needed to be done. Then, two weeks before Thanksgiving, Monk flew home to see his wife, Selena, and his two boys, Jack and Tyler. “Dad, did you build anything?” asked Tyler, 10. Before Monk caught his flight home, he spent eight hours in an airport in San Juan and thought about what he had seen—the stoicism of principals, the resilience of teachers, the tears of Keleher, and the diligence of the group’s driver, Manuel. “How are they going to get along?” he kept thinking. He also felt he got a clearer picture of the importance of what he does in Guilford County. “People talk about the need to focus on reading, writing, and math,” he says. “But you also have to make sure the facilities are maintained and the technical support is there so our students can learn, or they won’t learn it all. “You don’t want students going to school where classrooms are 80 degrees one day and 50 degrees the next,” he says. “You want them to have facilities they can be proud of, and you want them to know that we care about their well-being. Jeri Rowe (jeri.rowe@att.net) is a freelance writer based in Greensboro, North Carolina.